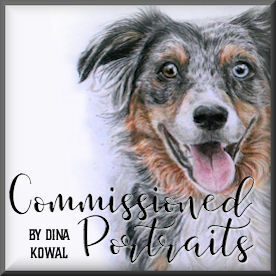 Dina Kowal Creative: Impression Obsession Spring Dies - Day 2! Impression Obsession Spring Dies - Day 2! Welcome to the Impression Obsession Team Spring Die hop! We have some beautiful new dies to share with you, and prizes too. Keep reading to find out how you could win a $25 gift certificate and get a few dies of your own! My card today is made with the Butterfly Block die, which is beautifully intricate and makes for a quick and elegant card. I used Stick It on the die cut panel, and I also used the negative cut to frame the die cut. The word stamp is from my Everyday Words clear set - it's a fun mix-and-match set that's super versatile. My card also fits today's Mix-Ability challenge over on Splitcoast, to create a mixed-media project using a winged thing! Such a beautiful card. I never saw this technique and can not wait to try it. Very pretty! Thanks for the tutorial! WOW!! How beautiful and it looks like so much inky fun!! Great technique, I do have a bunch of chalk reinkers! Interesting technique and it turned into a beautiful card. The first thing I noticed on your card is the background and I wondered how you achieved it... and the it was, showed in the video! Thanks! What a wonderful background! Thanks so much for sharing how you created it! It is a fabulous backdrop for this beautiful die! That die over those colors is beautiful. Lovely card. Pretty card! Love the background! Beautiful die and a gorgeous background. Dina your card is beautiful. Love the die. awesome Dina - I have all those reinkers! Do good to see there's something else to use them for? Does it have to be glossy card-stock? The background is wonderful, thanks for sharing the technique. The butterfly block die is amazing!!! Such a stunning card! OMG! I need that block die. Gorgeous background! That butterfly block is my favorite item of the new releases and I just the background that you created for it! I can never get enough butterfly dies! :) This one is a beauty!!! Wonderful card!!!! I love the technique you used for the back ground. This is a very pretty card. I have to try this. Such a lovely card....a good reminder that Spring is here! Thanks for sharing Dina!!! Really like the butterfly Die and it looks awesome in front of your bright colourful background. I love it! And must give the background a try. Thanks! Beautiful background for that great butterfly block. 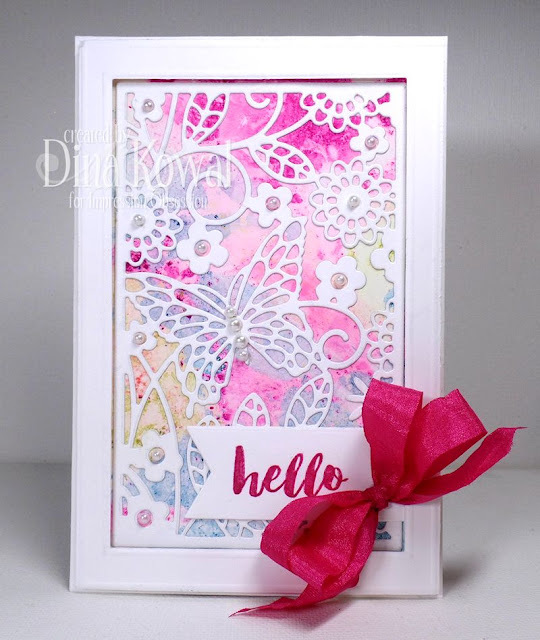 The butterfly block die is super and I love the background you created ! Back ground is very cool looking. Reminds me of a nail polish technique (which is done exactly the same way floating the color on the top of some water in a pan.) That butterfly die is beautiful. I can see how it makes the creative process quick! Thanks for sharing your technique. Such a pretty background! Love that butterfly block die! The butterfly diecut is GORGEOUS and the ribbon is perfect! What a gorgeous card! just love the butterfly block die. Will have to order one. Thanks for the video on floating chalk, always great to get new ideas. I love the die and love your card. This butterfly die is beautiful! I will have to check out that stick it paper and see how much it is... Love the pretty colorful background too. :) Thank you for sharing. Thanks for the quick video on the stunning background. It's a perfect backdrop for the butterfly block die. Love the butterfly die and thanks for sharing your video. I've never seen liquid chalk inks before. That is a fun technique. The die is gorgeous, as is your pretty colored background. Love your gorgeous background! Very pretty! Love your fantastic card. Thanks for the video. The background is beautiful. That butterfl y block is super! 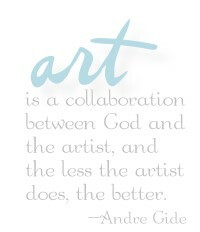 It creates instNt beautiful! Such a beautiful diecut! And thank you for the quick and easy background -- I have a few chalk reinkers that I need to dig out to give this a try. Truly Gorgeous card! Love the background & that beautiful die. Thanks for the great tutorial. Will have to invest in a few of those inks. lovely card. I sure like that die. Lovely card. I love that die. Absolutely gorgeous card - the bright, fuchsia-red Hello and ribbon really make it pop! Love the technique! THanks for the video. Gorgeous colorful background! And, love the butterfly block die...so pretty! Super precious with the white over that lovely background! WOW I really like that card cover die cut. Great card! Thanks so much for the video on the background technique. I'm going to give it a try. Very gorgeous creation, reminds me of a beautiful stained glass panel. I love the butterfly block die its officially on my wish list. Thanks for the ispiration :) :) :) !!!! Anything with a butterfly on it catches my eye! This is a beautiful die and the background only enhances it. Your background is amazing! The butterfly block die is so pretty -- a must have!! Thanks for the inspiration. I love this butterfly die, goodness makes the card so easy and I love that more. The intricate die cut sets off your beautiful background perfectly: a lovely card! Gorgeous creation in beautiful colours!